We occasionally carry out research on emerging trends and important issues in our sectors. This report was produced on behalf of the CIPR Fifth Estate (Not for Profit) group, to explore the extent to which communications is valued in the voluntary sector. 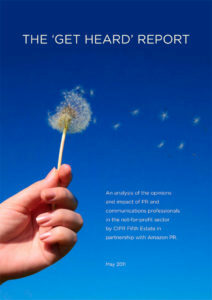 The report examines the advantages of recognising and valuing good communications – for professionals and the organisations they work for – and considers the risks posed when those professionals go unheard at senior levels. It also explores the extent to which funding reflects and alters the value given to communications, and the ways in which communications professionals can establish and build their position and voice in tough times. Engagement in the not-for-profit sectors: what drives it and what impact does it have?